INTERBLOG - Very nice organizer. Gotta keep all of them out of sight when not in use. I hate cable and wire clutter too (you know how bad I am ) Good tip and practice for everyone to use these un-utilized spaces, not just for cables. There is a lot in an AI. So much so that I firmly believe if I tried to utilize every square inch of storage in my AI, I probably would easily get way over GVWR without utilizing all of it. MANSDERM161 - Really nice stuff! You may need to add supplemental caging around your batt/inverter in case little kitty cat may find his/her old bedroom even more warmer & cozy with inverter heat. If/when you get chance, could you post better res pic of the batt & inverter trays, enclosures. Are they standard issue trays that can be bought or does LEW custom fabricate them for each job? Now I am itching to do this. I'll try to get better picks with better weather. It was still sprinkling, cloudy, dreary. There is no tray, just a bracket, appears to be aluminum, holding everything to the side. The rubber tray I had from a Honda odyssey that I put in back for cat and litter box. Lew cut it to fit around the battery and inverter. It is one battery, life blue 300, I think. The cat is too big to get on the inverter or battery. I spent the first night on way back home at cracker barrel with fridge, freezer, and fantastic fan on with absolutely no battery drain at all. Can finally sleep in peace when not hooked up. I just took it back to storage, but I bring it home every week, so I'll get some picks then. The pics posted were taken with my tablet. I'll use phone for next set. It was a lot of money, but now I really have freedom to roam, whereas before I had constant worry about finding a place to hook up or waking up with dead batteries. Another mod for the T1N crowd's consideration. Remember I switched out the rear hot water heater screwed-on face panel to a neodymium attachment system? 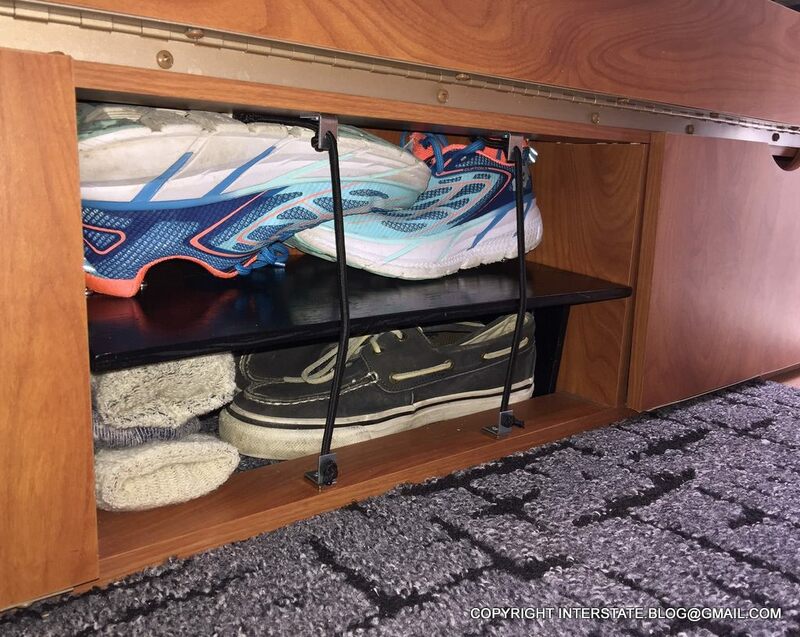 This is why I did that - so that I could convert the front void into more shoe storage. The relevant design element here is that the bottom bits of those two bungees are attached via another pair of neodymiums, and the shelf is also unattached, held in place only by the bungees, just like the shoes. 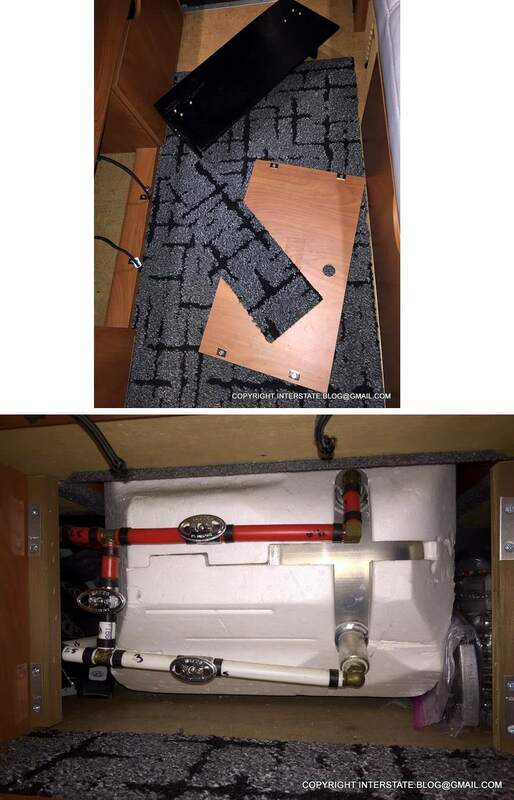 Therefore for vacuuming and retrieving lost items and messing with the water valves and generally getting back there under the couch, all of this stuff just lifts out of the way, and slips back into place after the work is done. I haven't decided if I'm fully satisfied with this design, but it's much better than what was in that space to start with. That's pretty good! Shoes are a challenge, and I don't see your waterproof shoes for rainy days. Or I guess you can just put plastic bags over your shoes like I had to do at Alumalina. I currently have no place for shoes! If you have a picture of the Bypass valve, would you please show it? Thanks! Waterproof foot ware is going on the roof. If I count rubber boots, then we sometimes need to take 12 pairs of shoes between us, rather than 10 (it sounds absurd, but I explained it in the blog post). But I'm waiting on an 8020 part that my husband ordered yesterday before completing that part of the roof mod. Yes, given that it now takes me 30 seconds to pull all the pieces out and access this water heater, here is the pic with the lines configured to run water THROUGH the heater. For those not familiar with valving, long axis of the valve knob parallel to the line means open. Perpendicular means closed. Reverse the order of the knobs to isolate the water heater for drainage. Then drain the rest of the lines separately using the spigots underneath the van. Oh look - there's a zip lock bag on the right side of the water heater that I didn't even notice until I uploaded this pic to Imgur. I wonder what's in it?? That's what I mean about things falling behind this couch. That Honda odyssey rubber mat was $100 so when I sold that vehicle, I kept it, had it in the back of Subaru outback, then got AI and it fit almost perfectly in back. It is light weight, washes off easily and obviously easy to cut. Lew knew I needed the space for cat litter box and cut it further to fit beside mods and litter box. For anyone who wants to travel with a cat, you have to go with regular clumping, minimal fragrance litter. If you go with light weight litter, it will be all over your rig and fragrance will drive u nuts after a few days! And those are not my imogis!